Heat oven to 350°F. Grease or spray four 8-inch round pans; place 8-inch round piece cooking parchment paper in bottom of each pan. Grease or spray parchment paper. In large bowl, beat all cake ingredients except food color on low speed 30 seconds, then on high speed about 2 minutes or until smooth. Spoon and spread 1 1/2 cups of the batter into 1 pan. Divide remaining batter evenly among 3 small bowls (about 1 1/2 cups each). Add different amounts of food color to each to make different shades of the same color. Stir each until color is well blended. Pour 1 bowl of batter into each of 3 remaining pans. Baking 2 pans at a time, bake 22 to 26 minutes (refrigerate remaining pans until baking). Cool 5 minutes. Remove from pans to cooling rack; remove parchment paper. Cool completely, about 30 minutes. In large bowl, beat butter and powdered sugar with spoon or electric mixer on low speed until blended. Stir in 3/4 cup tangerine juice and the vanilla. If frosting is too thick, beat in more juice, a few drops at a time. If too thin, beat in a small amount of powdered sugar. To assemble, place deepest color cake layer on cake plate. Spread with 1/2 cup frosting. Stack layers from darkest to lightest, spreading 1/2 cup frosting between layers. Thinly spread top and side of cake with 1 1/2 cups frosting to seal in crumbs. Divide remaining frosting among 4 small bowls. 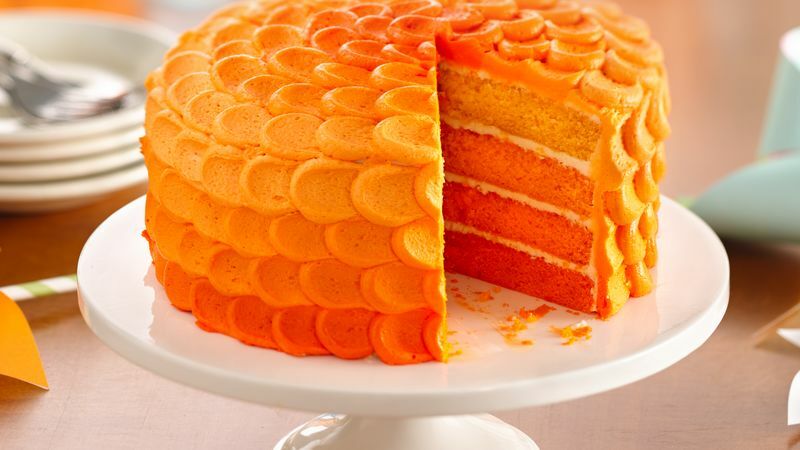 Add different amounts of food color to each to make different shades of the same color to match cake layers. To frost, place each color in individual resealable food-storage plastic bag. Cut 1/2 inch off 1 corner of each bag, and pipe each frosting on corresponding color cake layer. Pipe a dot of frosting and use back of table spoon to spread frosting horizontally around cake, with deepest color at bottom and working up to lighter colors; repeat around cake slightly overlapping dots of frosting. To frost top, use remaining frosting as desired. Store cake loosely covered in refrigerator. Don’t have enough pans? Store batter covered in the refrigerator while baking other layers. Cool pan completely before baking the next layer. While frosting, scrape excess frosting from back of spoon into small bowl; spoon back into plastic bag if necessary.